Jupiter/Uranus waxes, Saturn/Pluto wanes, miners are free! Thanks to global technology, it is possible for one extraordinary event to inspire the whole world. Today, in the papers, on TV and across the Web, there is much reflecting on the unique safe rescue yesterday of all 33 miners from the San Jose mine in Chile. “Heartwarming”, “humbling”, “inspiring”, “extraordinary” are just some of the words being heavily drawn on today, as the world’s media considers the awe-inspiring story which has galvanised us all over the last few days. Each of us will have a piece of the story which most powerfully strikes home. What is yours? Think about your horoscope….I have an exact Saturn/Pluto conjunction linked to several personal planets, all in the Twelfth House. But Tenth House Uranus is bi-quintile Third House Jupiter: prominent leading and closing planets in the bowl shape that is my birth chart. So I am not unfamiliar in my small life with times of the grinding struggle of endurance against severe adversity, coupled with an inspired (and I hope inspiring!) ability to make innovative leaps of faith in overcoming at times dire circumstances. In a very tiny way, with the current Jupiter/Uranus Saturn/Pluto energy field triggering my horoscope strongly, I can find in the challenging but liberating process current in my own life, a personal link to the great struggle and eventual triumph which has inspired and humbled us all in recent days. What must it have been like for these men to be trapped half a mile underground in sweltering heat and tropical humidity for seventeen days before the upper world knew they were alive? And what of their courage and discipline, given the desperate nature of such circumstances, in having the presence of mind to elect a leader to guide them? Yet they were able to choose a leader whose strong belief that rescue would come, and steadfast religious faith, was a sustaining plank. On this, they were able to construct the survival plan which saw them all survive sixty nine days of hell and emerge largely healthy and smiling, thanks also to an inspired and brilliantly executed rescue plan. I contemplate all this, and am awestruck. A great gift of being a long-term practitioner of astrology is that small thunderbolts of awe continue to strike one from the Left Field, no matter how used one becomes to seeing planetary symbolism play out in practice on a regular basis! 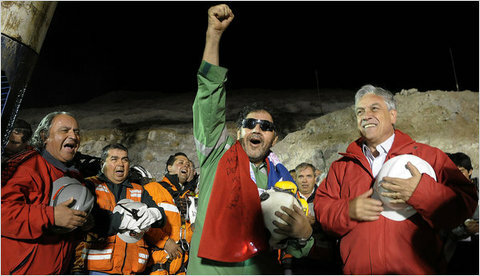 I find myself awestruck also by the appropriateness of the planetary symbolism in the Great Chilean Mine Escape story. Just reading through the above paragraph lets one see clearly the utterly different energies at work: the terrorising, grim, grinding, diamond-creating action of Saturn/Pluto – and the joyful “Show me a limit and I’ll blow it to smithereens to get to the light!” optimism, faith, creativity and innovative genius that is Jupiter/Uranus. Many astrologers will currently be putting up charts for the exact times of various stages of the unfolding of this tale: check out Best Astrology Sites to review what other astrologers have to say. As followers of this particular site will know by now, I tend to be happy these days with broad brush strokes. Firstly, I am interested in seeing and presenting the bold colours of the symbolism shining through the current planetary energy field, tracking its essential meaning – as I have been doing thus far. Secondly, the cyclic nature of planetary patterns is always fascinating and illuminating.This is the waning square of the Saturn/Pluto cycle which began in 1982/3 and peaked in 2001/2. It reached its first point of exactitude in mid-November 2009, its second end January/early February 2010. Its third came in mid-August 2010, just a few days after the miners’ ordeal began on 5 August when the San Jose mine collapsed. Sixty-nine days later as the miners are rescued, the pressure of Saturn/Pluto’s waning square is receding. The Underworld is relaxing its grip. And what of Jupiter/Uranus? Its new 14-year cycle began on 8 June 2010 at the powerful degree of 0 Aries. Its second exact point took place on 19th September at 29 Pisces: the San Jose Mine rescue began in earnest two days before. Its third and final exact point is yet to occur: at 27 Pisces on 4 January 2011. By mid-March 2011 both planets will once again be in Aries, the conjunction will be out of orb by 10 degrees, and the energy of the new 14 year Jupiter/Uranus cycle can be said to be fully in forward motion. At the time of the rescue, the energy of this cycle is still establishing itself. Jupiter/Uranus is coming into its full power: but Saturn/Pluto is receding. Faith, hope, and inspiration win. The grinding power of Saturn/Pluto has turned the miners into diamonds, whose toughness and courage got them through an ordeal which would have crushed lesser spirits. Thus we can see in the broad brush strokes of this tale both sides of Saturn/Pluto. And what of the shadow side of Jupiter/Uranus, so far presented in my account only in its bright face? I think that shadow is represented by the mine owners. One of the dark signatures of Jupiter/Uranus is breathtaking arrogance, conviction of one’s own rightness, thinking one is above the law – and that one can get away with murder, symbolically and literally. Many Chilean miners have perished in unsafe mines which should long have been closed down in recent years. The San Jose mine should not have been open: it was unsafe, and the owners must have known this. Let’s hope they will now be called to account….